Quick question, DR: Where are you getting these comics, from print, digital, or both? Mostly NOT digital, unless you see me list a title that's pre-Code, and public domain (those are available for free browsing and downloads at such sites as the Digital Comic Museum and Comic Book Plus). Generally, these are just a result of my rummaging through the longboxes of 50-cent comics at my LCS. Every few weeks it seems like new acquisitions from somebody's collection make their way into the store. If I had more time, and was better organized and systematic in my sifting through these boxes, I could undoubtedly find more old comics than I do; but as it is, a lot of my time is taken up looking through and reading this week's new comics. I'm always keeping an eye out for comic book obscura, those titles that are short-lived, from tiny (sometimes unheard-of) publishers or self-published, and genres generally unpopular with comic book collectors (like teen humor or romance comics), or just anything oddball or retro-looking. You have to sift through hundreds, if not thousands, of titles from Marvel, DC, Image, and other well-known publishers to find the off-trail titles, the ones collected only by the rare few. Mostly what I find are comics that have been READ (in fact, often "read to death"), but not COLLECTED by anyone per se... merely saved, but in a casual manner that indicates that the last owner didn't place much value on them (unless they're pretty recent, from the last few decades, and so didn't receive much handling; read but once, and stuck in a box somewhere). Often they are falling apart, crumbling with age and flaking apart if 40 or more years old; with tears, folded corners, rips and hand-written on by kids (often kids would write their names on the covers, or doodle on the cover or interior pages using pens of various colors). If I happen upon Archie titles (or ANY teen humor title), it's always worth at least flipping through to see what's in it. Since I know the owner of the store and have been friends with him for many years, I often take a stack home to read, then return most of them a few days or a week later (except the maybe 10-20% that may be of particular interest, and in better than 'fair' condition). Since other customers rarely seek these kind of titles, it's NBD if they disappear from those 50-cent boxes for a week or so. Rarely, if it's an older one even in the most beat-up condition, I may keep it (bagging and boarding it to prevent it falling into even worse condition, even though it's practically worthless as a collectible) if it contains some stories I haven't seen reprinted elsewhere. Not very practical if what you're looking to read is an issue of BINKY'S BUDDIES, DEBBI'S DATES, or ANGEL LOVE... or THAT WILKIN BOY or MADHOUSE GLADS from the late 1960s or early 1970s. Obscure older titles just don't attract enough readers to be viable candidates to be digitized, unless they're so old that the copyrights have entered public domain. There are torrents, I guess, if issues about piracy don't bother you. The thing about a back issue is that you know that it was published, so it has to exist somewhere. Not so for digital comics, which only exist if the companies who hold the copyrights to a printed comic book consider it worthwhile digitizing... if they think there's a market for it from which the publisher can generate some extra profit. 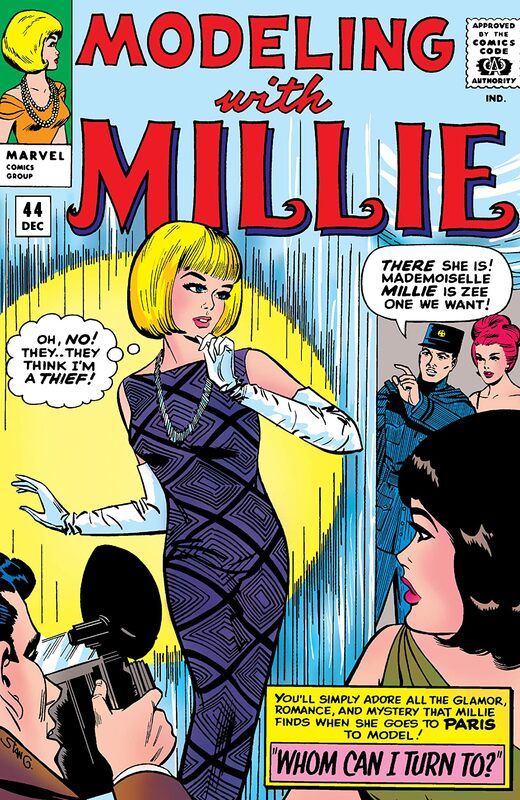 It's incredibly frustrating to me that I'll never be able to read hundreds of pages of comics that Dan DeCarlo drew for Marvel in the 1950s (MILLIE THE MODEL, SHERRY THE SHOWGIRL, MY FRIEND IRMA, and on and on), because nobody at Marvel considers those issues worth making available in digital format. You might think that anything Marvel or DC ever published that was worth reading would have been reprinted or digitized by now, but only a small fraction of what they've published over 80 years or so has been. Ditto for Archie Comics, which still hasn't digitized hundreds of its published comics from the 1960s, like JOSIE. Only a scant few of the published stories are available in digital format, appearing in digests or collections. As back issues, many of those JOSIEs are extremely difficult to find or prohibitively expensive as collectibles for all but the most well-heeled of comic book collectors. When it comes to public domain material, where the copyright on the original comics has expired, it only takes ONE person with a copy of that comic book and a desire to share his or her love of the stories with other readers to scan it and upload it to one of the existing public domain comic book websites, as a labor of love. I could sit here and make lists of hundreds of comic books (or just individual stories) that I know exist and would love to read, but I will never be able to read or own, due to the relatively few copies of the printed comics still in existence, most of them locked away in private collections, or too expensive for me to ever afford as collectibles. It's incredibly frustrating, so I have to make due with what I can find in lesser conditions, catch as catch can, while rifling though longboxes of cheap old back issues. At least those comics you can see and examine, to discover what the contents of the comic book are. Unless you know that a particular comic contains stories or work by a particular artist that you want to read, you'd never even look for or at it. My feeling is that I'm never going to prefer a digital comic if it's just something that's commonly available as a print comic. If they both cost the same and are just as available, why would I want the digital version? It's only attractive to me if it's something I can't otherwise get as a real book, or a cheap replica of an otherwise expensive or hard-to-find collectible. Public domain Golden Age comics that have been scanned and are FREE are a major attraction by comparison to expensive, uncommonly found, and physically fragile paper collectibles from the 1940s or 50s, and so are Japanese manga scanned and translated by otaku, that wouldn't otherwise be available to read in English. Other than those type of things it's hard for me to see where they have any superiority over print comics. 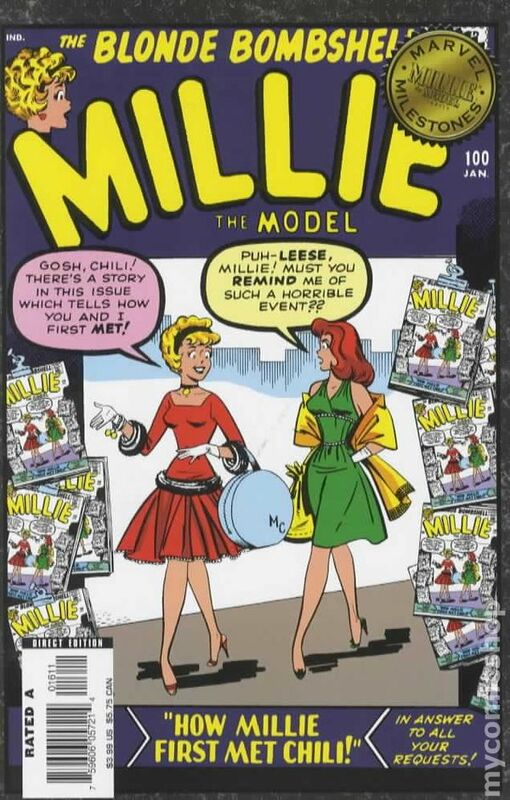 It's because Millie the Model #100 was reprinted as a floppy comic (together with a Patsy Walker story), in Marvel Milestones: Millie the Model & Patsy Walker, in 2006 (which I own). And Modeling With Millie #44 was reprinted in the 2006 hardcover collection, Marvel Visionaries: Roy Thomas (because the lead story in that issue, "Whom Can I Turn To? 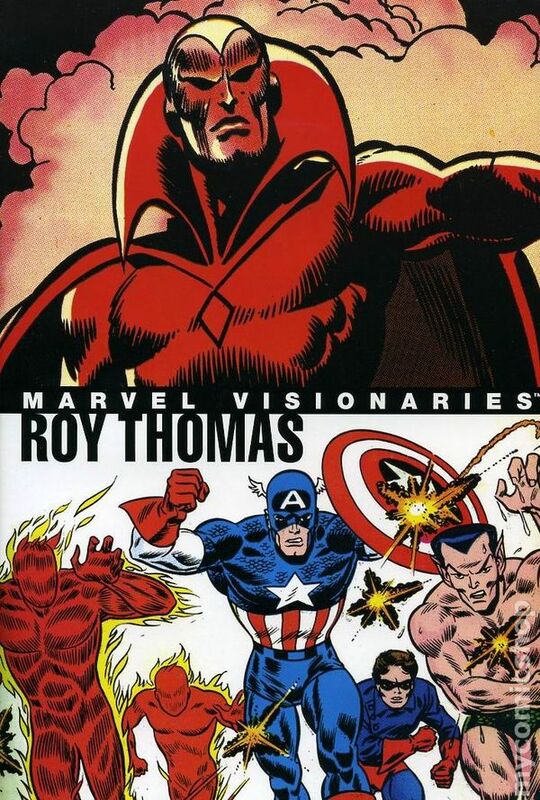 ", was the very first story Roy Thomas ever wrote for Marvel Comics, back in 1965 (he eventually became editor-in-chief there, from 1972-1975, before going freelance, then eventually defecting to rival DC Comics in 1981-1990 as a writer-editor). While I don't own that particular hardcover yet, I've been keeping an eye out for remaindered discounted Marvel hardcover collections, so it's one I'm watching for. Too bad it's one of the later, soap-opera drama issues (with Stan Goldberg in his more realist style), instead of one of the earlier 'girl-humor' genre issues. Since any reprinting in recent decades involves scanning and cleaning up pages of original line-art, and recoloring, why not add those stories as digital singles just so they can squeeze a few extra dollars out of the effort to reprint them in the first place? Ah, now we can see the method to the madness of random digital comics. Not trying to be snide here, SAGG, and I do appreciate the thought. It's just that the big companies rarely do anything without some reason. But oh, what digital delights are out there on the interwebs, just waiting to be found for FREE! Takes a little work, but OH so worth it!!! And speaking of MY FRIEND IRMA, as I was a couple of posts back, I found an incredibly rare example of Dan DeCarlo's first comic strip work (together with Stan Lee as writer) - a single month's worth of daily newspaper strips that were syndicated way back in July of 1952. At this point in time, DDC had only been working professionally in the comics industry for about four years, but his work is amazingly polished and he has the artistic confidence of a seasoned veteran cartoonist many years his senior. Beginning as a radio series in 1948, MY FRIEND IRMA spun off into two feature films (which gave the comedy team of Dean Martin & Jerry Lewis their first big break to movie stardom), and then a television series in 1953 and 1954. By then, it had already been translated into an Atlas (Marvel) comic book written by Stan Lee and drawn (mostly) by Dan DeCarlo (which eventually ran for 46 issues from 1950-55), and finally in 1951 it was turned into newspaper comic strip... with absolutely terrible artwork. Too late, once the strip was really struggling for subscriber newspapers, the creators of Irma took a look at the comic book stories, and said "Why don't we get THOSE guys to do the newspaper strip??" Alas, it was probably too late by then, as the syndicated comic had just lurched along for a year or so, losing papers left and right, despite high initial interest by subscribing papers, and the ongoing popularity of the radio series, movies, and comic book. Stan and Dan did a great job for the last year, but... it was just not to be. They couldn't reverse the damage done by the initial artist on the strip. If only the creators of the show had been smart enough to hire them in the first place!